Look at them stylin' ladies! I kinda miss those days, which is silly because it was before my time. I agree. Seems like home. Totally. 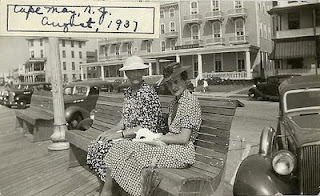 There was much more style back then - the clothes, the cars, etc. Interesting photo, great blog, fabulous poetry! Great shot of the ladies. I just got dozens of photos of my Gram from an uncle. This one would fit right into the mix. so great to uncover gems like this. i had never seen this photo until very recently! kenny, sheesh, thank you! you can stay. Oh, I love love love that! Great photo!